“Moving to California during the great recession was challenging. Watching my oldest daughter move to Monterrey, my second daughter move to Chapel Hill, NC and my son stay in college in Rhode Island was life changing. Settling into life with my husband and youngest daughter in my new home and State took adjusting on the part of all of us! Learning that my brother in law was diagnosed with pancreatic cancer and passing was another bump in the road. Missing my hometown and family was void I was feeling daily. Running and weights was just not fulfilling my inner desire for contentment. 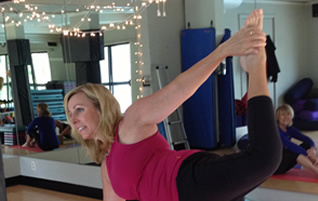 Leena is dedicated and always teaches her class the proper positions and disciplines of yoga. Leena and her teachings have spread to my 16 year old loving her yoga and the promise of my husband joining us to complete his search for peace and positive growth.